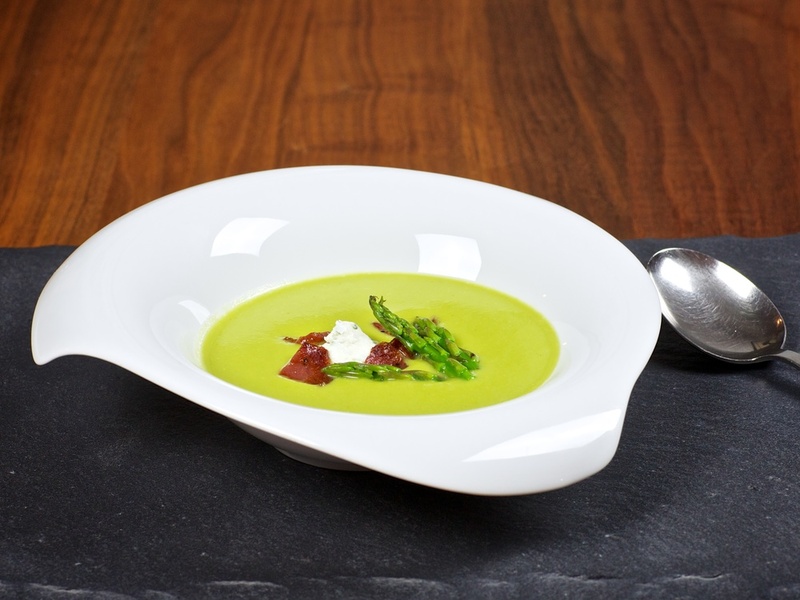 I have always known an asparagus soup as a white hot creamy soup. And there is nothing wrong with the classic soup, not at all. But for me it's more a soup for the winter months. The fine new delicate white asparagus you're able to get in the stores or farmers markets in the spring has a sweet and delicate taste, which is perfect in a cool soup like this. Bring water, chicken paste, wine and sherry to a simmer in a medium pot over high heat. Add asparagus and leeks and cook until tender when pierced with the tip of a knife, 8-12 minutes, for thin to medium thick asparagus. 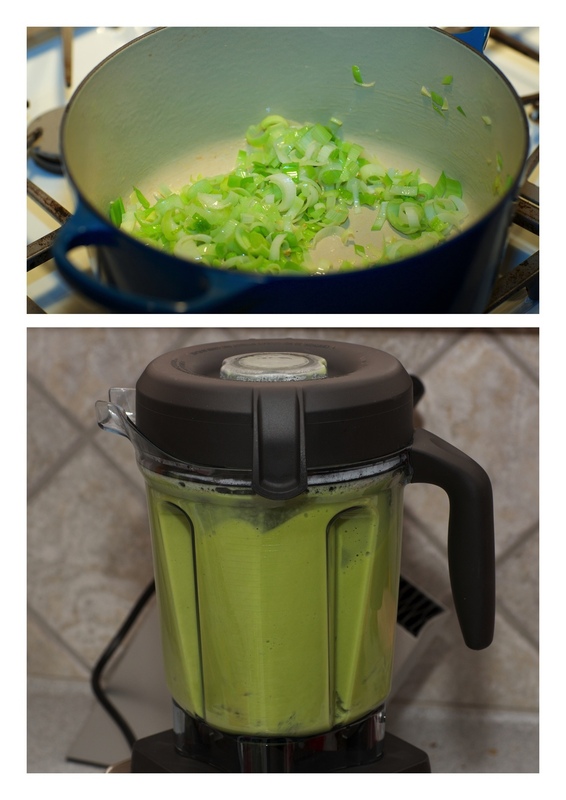 Transfer asparagus and leeks to a blender with a small amount of the liquid. Add the creme fraiche and some of the lemon juice, and blend until smooth. Add more of the cooking liquid if the blended soup is too thick. Season the soup with salt and lemon juice. In the leftover cooing liquid, give the asparagus tops a quick blanching. (Bring to a boil, and quickly cool down in ice water.) Put the tops in the refrigerator. Chill the soup in the refrigerator for at least 3 hours or overnight. Just before serving fry up the chorizo until crispy. Serve the soup in small glass bowls with a small amount of topping. * I use Better Than Bouillon pastes in my dishes. I think it has a better flavor than the dry bouillon cubes or other brand name stocks. And I think that the paste has seen real ingredients like chicken, beef and vegetables. But I do believe that du get the best flavor by using your own homemade stock. But to be honest, I rarely have time to make homemade stocks. Inspired by "Spise med Price"
2 Bundter hvide asparges, vaskede, skrællede, gem toppene til senere. Kog vand, bouillon, vin og sherry op i en gryde sammen med de skrællede asparges (minus hovederne) og porrer. Kog indtil aspargesne er møre, men stadig har lidt bid. ca. 8-12 minutter, alt efter tykkelse. Kom de kogte porrer og asparges over i en blender sammen med lidt af kogelagen, creme fraiche og lidt af citronsaften. Blend det indtil du får en jævn og ensartet suppe. Tilsæt mere af kogelagen, hvis suppen bliver for tyk. Smag suppen til med salt og citronsaft. I den overskydende kogelage blancheres aspargeshovederne. (De bringes i kog og køles hurtigt ned i isvand.) Kom de blancherede hoveder i køleskabet indtil de skal bruges. Afkøl suppen i køleskabet i minimum 3 timer før servering, eller natten over. Lige før suppen skal serveres steges tynde skiver af choizoen til den bliver sprød. Server suppen i små glasskåle eller glas, og kom lidt aspargeshoveder og choizo på toppen.